| DOWNLOAD | Through Adfly (Wait 5 seconds, click “skip ad” to reach DL) Thank you!! Notes: These nails are found in the “shoes” subcategory. 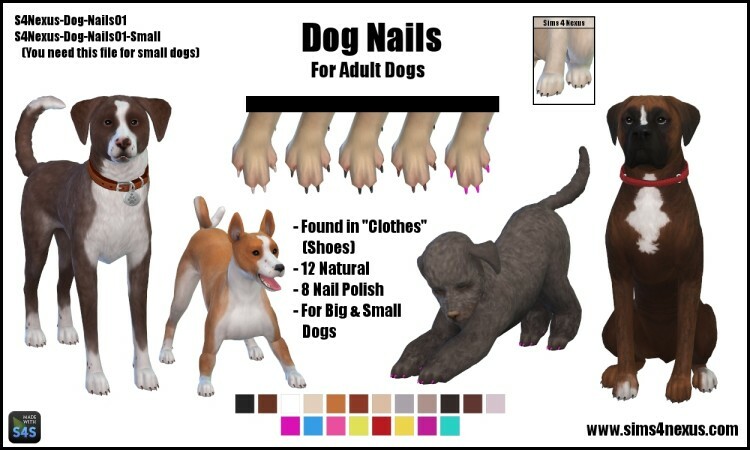 EA does not have any pet shoes so far, so it will not show up as a subcategory, but if you check in clothes, they should be there, at the bottom, and they stack with tops, hats, collars, outfits, etc! The 2 big dogs on the sides are made by Blue Ancolia and available for download here and here. Aren’t they gorgeous?